Sadly, George Meikle Kemp died when the monument was only half completed, on the night of 6th March 1844. He is thought to have lost his way in very thick fog after visiting his contractor near the old Canal Basin in Fountainbridge. His body was found in the canal one week later. Over 1000 people attended his funeral. His coffin was carried to St Cuthberts graveyard by his workmen, who by all accounts, thoroughly respected his humble origins and great depth of knowledge. After Kemp's death, work continued under the supervision of his brother-in-law, William Bonnar. He proposed an amendment to the height from 176 feet to 200 feet and six inches. For a while there was dissent from outsiders, especially when a rise in costs from £10,000 to £12,000 was forecast. However, when workmen on the project offered two weeks labour without pay in order to support Bonnar, the money was found. The photograph to the right shows a group of workmen taking a break from their task of building the Scott Monument. In the background you can just make out the Castle and the Royal Scottish Academy. 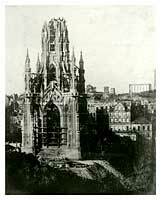 This photograph of the Scott Monument under construction was taken in about 1844. The near background with the buildings has changed, the houses there no longer exist and the view of Calton Hill is obscured by the Balmoral Hotel on Princes Street. Both of these photographs were taken by David Octavius Hill, (1802 to 1870) who was born in Perth and established himself as a fine landscape painter. By the age of 19 he had published a series of landscapes using the lithographic process. He was a founder member of the Royal Scottish Academy in 1826, and was involved in the creation of the National Gallery of Scotland in 1850. His partnership with Robert Adamson (1821 to 1848) produced some of the finest photographic portraits and landscapes of the 19th century, using Fox-Talbots’ ‘Calotype’ method, not patented in Scotland. In under five years they produced 1800 pictures. Adamson died at the age of 27, and Hill returned to painting in later life. Hill's wife was the sculptor Amelia Paton whose character statues can be seen on the Scott Monument.